Replacement:DEV-11767. The manufacturer has revised this graphics controller, go check it out! This page is for reference only. 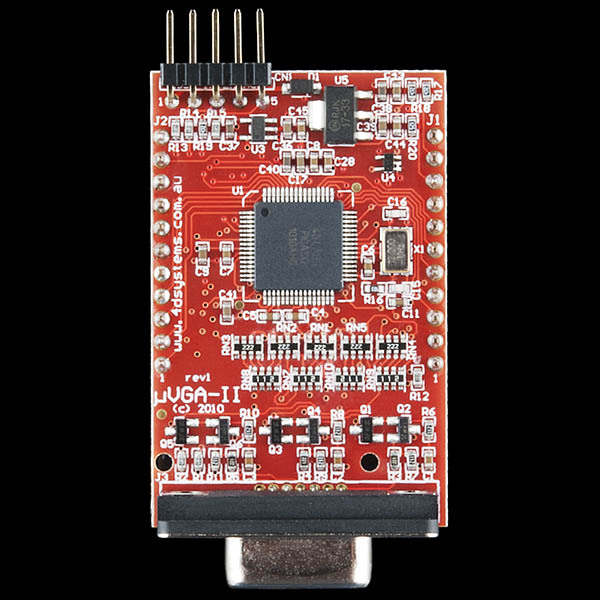 The µVGA-II(SGC) is a compact & cost effective drop in embedded graphics engine that will deliver stand-alone functionality to your project. The simple to use embedded commands not only control background color but can produce text in a variety of sizes as well as draw shapes in 256 colors while freeing up the host processor from processor hungry screen control functions. 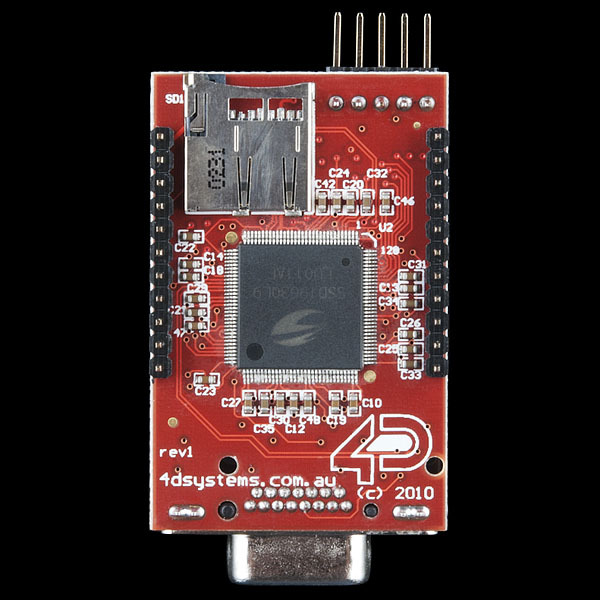 This means a simple micro-controller with a standard serial interface can drive the module with ease. Supports RGB 65K true to life colours in QVGA, VGA, WVGA and Custom resolutions. 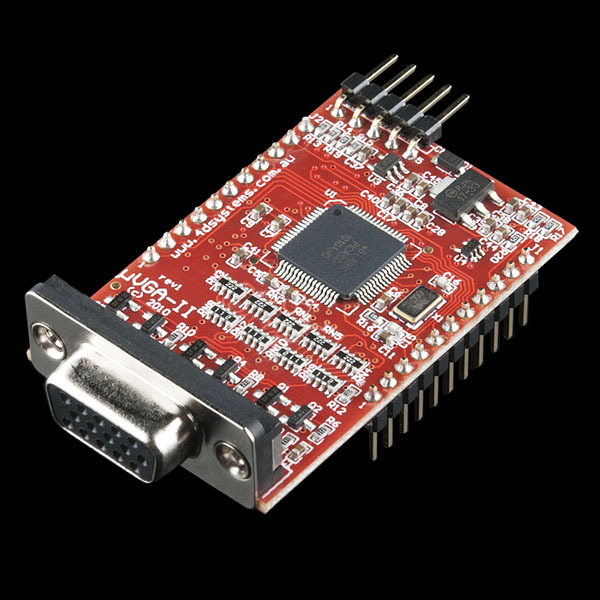 The µVGA-II(SGC) supports multiple resolutions within the same module. Resolutions are selectable during run time under host control. Resizeable viewing window allows partial/full screen control. 15 pin D-type standard VGA connector to interface to any external VGA monitor. Asynchronous hardware serial port, TTL interface, with 300 baud to 256K baud. Future upgrades and enhancements are easily achieved by uploading PmmC (Personality module micro Code) files. PmmC files allow the PICASO chip to be uploaded with the latest micro-Code firmware. System designers can incorporate the µVGA-II(SGC) module directly into their application, saving space and cost. Reference designs enable the user to create a platform to incorporate the µVGA-II(SGC) easily. Note: These modules can be easily switched from SGC to GFX by a simple firmware change. Visit the product page link below for more information. Hey guys, I'm trying to advertise an indiegogo (it's like Kickstarter) project at http://www.indiegogo.com/projects/graphic-card-for-embedded-systems?c=home you should check their video examples. Last week I've been trying to order a LAVA10 from MYLIUM (which looks like a pretty capable VGA/SVGA controller), but they were out of stock and their engineer informed me that he was developing a new controller as a successor and wanted to crowd-source the development costs. He kindly asked to spread the word about it, so here I am. 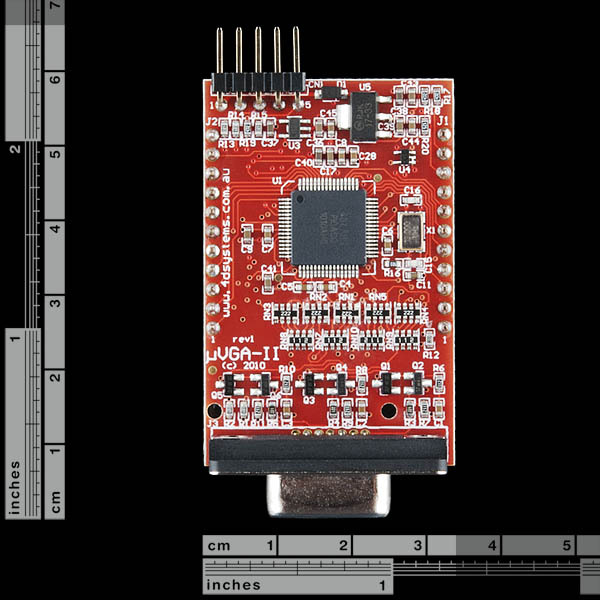 According to the datasheet you can use these as standalone development boards too, they have gio pins for inputs and outputs. Sooo. could they be used by themselves without a arduino or other brain?? this GPU is VERY slow and VERY badly documented, the manuals having many faults. if you are thinking of using this for rendering even NES-like game graphics, don't consider this at all. after a week of trial and error, you can actually do some useful stuff with it. playing animated .gif files is one of the coolest, especially knowing you can play sound while this happens for playing video (haven't tested this yet, may lag too much to be useful). SD functions are quite limited too, you can't put or use files inside folders. so, I sort-of regret buying this, but I'm going to try to make the best thing I can with this. already have a colourful command-prompt thing working! No, this product does not come with the programming cable. I got the unit working in SGC Mode, but moving screen data serially to the uVGA is pretty slow. Now I'm converting my project to GFX (4DGL) mode. It's a whole different ballgame. Given the great difficulties many purchasers are having with this product, there should be sample sketches showing how it's used. 4D offers little support on this product. He's using the GFX. There's virtually no known examples of the SGC mode. Doesn't look like it supports SVGA. Might want to change that title. In the description you say 256 (8-bit) colours for drawing, yet the features list says 65K colours (16-bit). While reading through the product page, I noticed the serial commands for drawing do support 16-bit colours in the 5:6:5 RGB format. Also, there is a command to switch between 8 and 16 bit colour I think. Can someone clarify or confirm these statements? From glancing at the command set, looks like vector drawing is in the form of 16-bit colors while bitmap drawing can be specified in 8-bit or 16-bit. It doesn't specify the 8-bit mask format, but I'd assume it's RRGGGGBB. I don't have any of 4D's graphics products but this one is calling my name oh so gently.